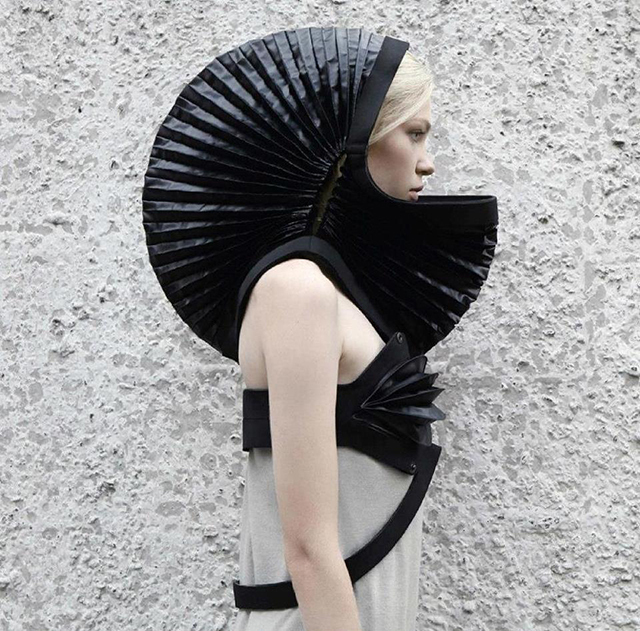 Ukrainian designerTechnogenesis collection. One jaw-dropping piece in the collection is the Transforming Neoprene Hood Dress, a unique black dress made with a futuristic combination of dense knitted fabric and matte neoprene. The front part of the bodice is lined with black rayon, but the transforming hood is lined with black raincoat fabric and features laser cut patterns. Irina says that the main idea behind Technogenesis is "about regeneration of the anthropogenic civilization's destructive priorities into a virtually new trans-marginal existence in order to create the post-utilitarian aesthetics." The young designer used traditional textiles combined with industrial materials to achieve the desired "post-utilitarian aesthetic."